Only in Anchorage, Alaska can competitors square off in outhouse races, craft massive yet intricate snow sculptures, and dash to keep clear of reindeer Pamplona-style. More than 15 zany events and 100 other activities are found at Alaska’s largest and oldest winter festival, Anchorage Fur Rendezvous, which is slated for Feb. 22 to March 3, 2019. Known locally as Fur Rondy, the event has been going strong for more than 80 years. The event started in 1935 as a three-day sporting event timed to coincide with the return of miners and trappers loaded down with the fruits of a winter of work. 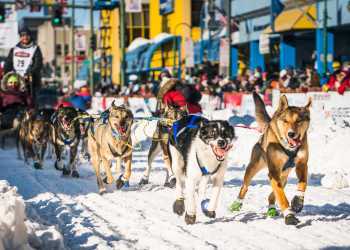 The original event featured skiing, hockey, basketball, boxing and a children&apos;s sled dog race down Fourth Avenue. Sports are still a big part of Anchorage Fur Rendezvous, but sprinting before reindeer or steering the fastest outhouse on skis put Rondy in a league of its own for competitive spirit. Fan favorites like the Outhouse Races and Running of the Reindeer, a mad dash down the streets of Anchorage with caribou at the racers’ heels, always draws a crowd. In the Rondy World Championship Sled Dog Races, dog teams and their mushers complete a high-speed loop daily for three days with the fastest time the winner. The competition, which began in 1946, is considered the grandfather of all Alaska races. The 2019 sled dog races begin on Fourth Avenue at D Street, and run out and back to Campbell Creek. Despite a multitude of modern diversions, many traditional Fur Rendezvous events have withstood the test of time – several of which showcase Alaska&apos;s rich and varied Native cultures. Fur Rondy&apos;s Blanket Toss mimics an ancient Alaska Native whaling tradition in two ways; a walrus skin is used, and everyone can have a turn to either jump or grip the blanket&apos;s edge while tossing others as high as 20 feet into the air. What a view! Arts and crafts are a significant part of Alaska Native culture, and Rondy incorporates displays of intricately crafted works, from beautifully decorated showpieces to art that evokes traditional ways of life. Find creations from all over the state at The Charlotte Jensen Native Arts Market. There truly is something for everyone. For even more Fur Rondy information, including the schedule of events and travel specials, visit the Fur Rendezvous website. *Prices may vary. Subject to availability and fees. Sports are still a big part of Anchorage Fur Rendezvous, but sprinting before reindeer or steering the fastest outhouse on skis put Rondy in a league of its own for competitive spirit. Fan favorites like the Outhouse Races and Running of the Reindeer, a mad dash down the streets of Anchorage with caribou at the racers’ heels, always draws a crowd. In the Rondy World Championship Sled Dog Races, dog teams and their mushers complete three high-speed, loops over three days with the fastest elapsed time the winner. The competition, which began in 1946, is considered the grandfather of all Alaska races. The 2019 sled dog races begin on Fourth Avenue at D Street, and run out and back to Campbell Creek. Try these locations. All offer easy access to the free Rondy Shuttle stop locations. AC Couplet Lot, 3rd Ave & C St.
J.C. Penny Parking Garage, 6th & E St.
5th Ave Parking Garage, 5th & B St.
Lenny Pacillo Garage, 6th & H St.
Anchorage Museum Parking Garage, 7th & A St.